This is a question I get quite a bit from my family and friends alike when I tell them I’m a Salesforce Software Engineer. While it would probably be shorter to write a post about what Salesforce ISN’T, I’m going to do my best to summarize anyway. If you have a little bit of a technical background, one of the best articles I’ve seen that defines Salesforce is one from Admin Hero about how Salesforce is a relational database. Either way though, I’m going to do my best to summarize as well as I can about how I explain Salesforce to people. If you don’t have a ton of time, you can skip to the TLDR section, and/or check out the links at the bottom on Trailhead. Usually the first thing I tell people is that Salesforce is a Cloud CRM Platform*. That description itself generally leads to more questions so I’ve stopped even waiting for the ask and just continue explaining. 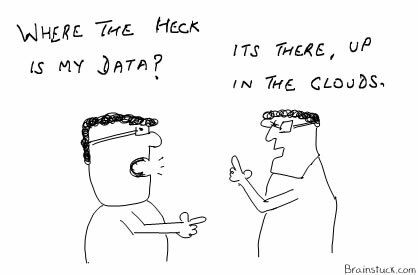 While a lot of people out there are still afraid of, confused by, or just hesitant to adopt cloud computing, it really isn’t that scary. Basically you just throw all of your data up into the air and it lands in the clouds! Simple right 😀 A little bit more seriously though, all cloud computing really is, is regular computing, that you don’t have to worry about taking care of because you’ve already hired a professional to do it for you. You don’t have to care where it sits, don’t always have to manage the security, and can for the most part manage as much or as little of it as you want to. As I stated in my first post, I’m all for efficiency (my way of explaining my laziness) so I’d like to have to worry about as little maintenance as possible. With cloud computing, I don’t have to go find physical storage drives, or a room to house my servers, or open up the back of a server to add additional CPUs. I just tell a computer somewhere “up in the clouds” what I want and the cloud computing fairy magically makes it happen (the fairy isn’t free unfortunately though but I was going to have to pay for everything anyway). Once you’ve wrapped your head around the idea that Cloud computing is really just a more convenient way to perform ordinary computing, I like to describe the concept of CRM, or Customer Relationship Management. In case you ever doubt Salesforce’s roots, look no further than their stock ticker symbol; NYSE: CRM. In a nutshell, CRM, as the name states, is the act of managing your customer relationships. Generally you’d keep track of different customer accounts, each of which will have its own unique contacts. Depending on your business model, your customers may be individuals, companies, or both! This is pretty much a universal truth for any entity looking to sell a good or a service. These customers would generally start out by showing some sort of interest in your product, whatever that may be. You’ll also probably be interested in finding more customers to consume your product and undergo a process known as lead generation. As your unique sales cycle progresses, these possible sales, or leads, will generally turn into more sales, or opportunities for you to grow your business. The farther along a customer goes down the sales cycle, the more likely it is that your opportunity will successfully close. Managing all of your customer accounts, contacts, leads, and opportunities, can be tiresome, which is where Salesforce comes in to give you a product that can do precisely that. This product comes in the form of a platform. The reason I use the term platform rather than software is because you don’t have to install anything. It’s also not really just a solution because it does more than just solve your CRM problem. Maybe you also want to have an option to manage your company’s service requests, or handle all of your marketing that I mentioned in my previous post, or perhaps you’re really trying to grow your business and you want to develop a community around your organization. Furthermore, at some point your organization will probably begin to rely on some sort of reporting or analytics to help you close more deals. You most likely also have your own terminology and processes specific to just your organization that you would like to be able to use while running your business. Salesforce is the PLATFORM that lets you do ALL of those things and more. Oh and by the way, it also does CRM, gives you a ton of automation capabilities, and it does it all in the cloud so you can access it from any device including a computer, tablet, phone, watch, or any other product you want across the wide Internet of Things. Forbes has recognized them as one of the world’s most innovative companies several years in a row for many of the above reasons. In 2015, Salesforce finally cracked the Fortune 500 and Gartner shows that they are truly the leader in CRM over competitors Oracle, SAP, and Microsoft. While Salesforce is great at many things, there are some things that Salesforce is not great at. I read a great article from one of the emerging leaders in the Salesforce industry, Ryan Lorenzen, that mentioned a great piece of advice; “Be an evangelist, but don’t drink the Kool-Aid”. Part of being a great architect, or even a great admin or developer for that matter, is understanding where the capabilities of Salesforce begin and end, both from the declarative side, and the coding side. Even if you don’t understand both sides well, knowing when to use which type of solution, is tremendously valuable on its own. While Salesforce is recognized as a technology company, what they truly represent goes way beyond technology. Like Steve Jobs recognized (and I myself subscribe to), your technology can be great but you need to have something more to it. You really need to also pay key attention to your customer experience. Salesforce has lately begun marketing itself as the Customer Success Platform, rather than a CRM tool. When you ask them what they do, they say that they “help make your customers love you”. On top of being an option for just about any for-profit company with any sort of decent business model, Salesforce also has created a specialized solution (and gives discounts to) the non-profit organizations of the world. Furthermore, they ensure to give back to their communities that they serve with their innovative 1-1-1 model, which gives back 1% of time, 1% product, and 1% equity to those in need. Their founder, Chairman, and CEO Marc Benioff is also well known for publicly standing up for the rights of LGBT community as well as making a pledge for gender equality. I truly think it’s a disservice to try to explain Salesforce to someone without mentioning these key differentiators as well. *The platform is traditionally referred to as the Force.com Platform or the Salesforce1 Platform. Salesforce.com is generally used in reference to the standard CRM software provided. More information can be found from SalesforceBen here. More info on what Salesforce is, aimed at end users. More info on what Salesforce is, aimed at administrators and also more info here. More info on Salesforce behinds the scenes, how it works, and what makes them so successful beyond the technology. « Who is Adam Olshansky?